Here is a tidbit of data. 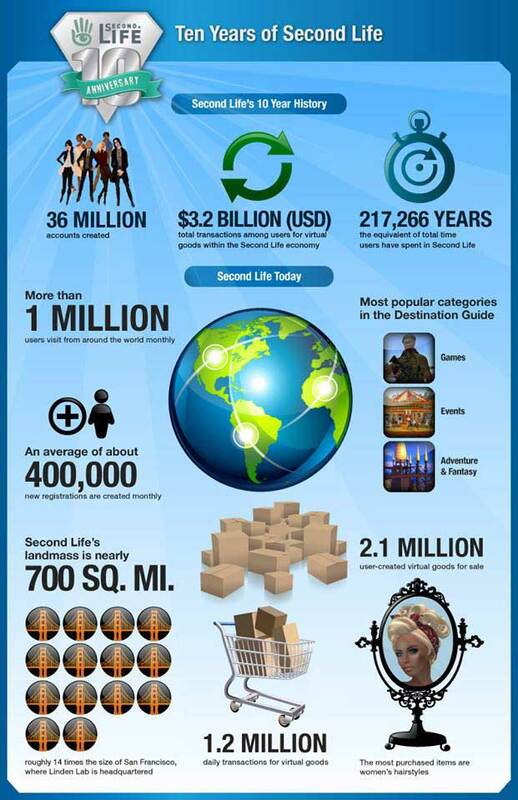 There is an interesting poster that popped up on Facebook about Second Life™. It has a few stats about SL. Posted in Second Life. Tagged Stats. Daniel Voyager posted an article on mesh viewer adoption statistics. The stats were collected by Kadah Coba, one of the Firestorm developers, and put into a graph Daniel found posted on SLUniverse. I am assuming that Kadah used stats the FS Team collects from the splash page of their viewers or viewer stats that come from the Lab or… may be some combination of sources. It is hard to find good statistics on Second Life™ that tells us what is happening. Nor have there been any exciting ‘statistical’ developments this year. So, I haven’t been writing much about them. I did want to summarize them for 2012. It took me some time to get around to it. But, here they are. 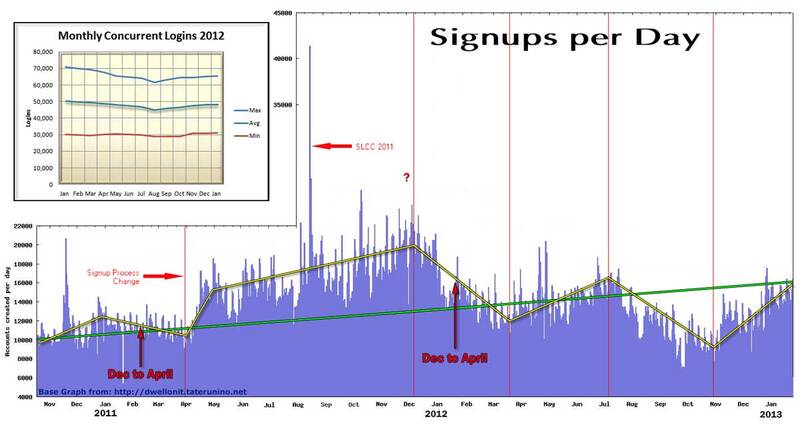 Signups per day tells us something. It is just debatable what exactly. We can’t separate re-signups, those creating Alts, from new users signing up. We can’t even get an idea of how many people may be going for an Alt. My belief is the majority users have at least 1 Alt. But, we have never known and as far as I can see there is nothing that would have changed the rate of users creating Alts. So, the signup rates are hopefully consistently distorted. Posted in General News, Second Life. Tagged Stats. Well… everyone is talking about the decrease in the number of concurrent users. I have certainly noticed the currently online numbers displayed at login decreasing. In 2009 I was seeing 80,000 and climbing. Now it is rare to see 70,000 and common to see around 40,000 to 65,000 with the median generally reported to be about 52,000. So, is SL dying? Is the sky falling? Posted in Philosophy, Second Life, Server, Statistics. Tagged Stats.